Updated 02-06-12. Below is a collection of frequently asked questions about Ui-Cha! Pho, our menu items and products, our customer service philosophy, and everything else related to Vietnamese pho noodle, Vietnamese iced coffee, Vietnamese banh mi sandwiches, and Vietnamese cuisine in general. We welcome more questions, the more the merrier. Leave your questions in the “Leave a comment” section at the bottom of this page. How do you pronounce Ui-Cha! and what does it mean? Ui-Cha! pronunciation, Southern Vietnamese accent. Sometime a single sound doesn’t really do justice. So below are a few additional phrases with proper pronunciation of “pho” in conversational usage so you get a better sense of the word “pho” and its inflections. You should be able to identify “pho” with no trouble. But more importantly you can identify the word “pho” even when spoken in Vietnamese. Try numbers 3 and 4 below. 3. “Let’s meet for pho at about 8 tonight” in Southern Vietnamese accent. 4. “How is your beef pho?” in Northern Vietnamese accent, to lady friend. These audios are sourced from the article Pho Pronunciation: You Can Say It, Pronounce Pho, Say: Phở… published on our popular pho blog lovingpho.com dedicated to discussing everything about pho, what it is and how to enjoy it. How does Vietnamese cuisine compare to mainstream Asian cuisine? What come to mind as mainstream Asian cuisine include Chinese (definitely) and Japanese (to a large extent.) Whereas in large metro areas (New York, Los Angeles, San Francisco, Seattle, etc.) both Vietnamese and Thai cuisines can give Chinese food a run for its money, here in Missoula Vietnamese food may not be that well known (yet). It’s not easy to describe any cuisine in a few sentences, but we’d say that Viet cuisine is based mainly on rice products as the base (steamed rice, rice noodles, and rice paper wraps), with proteins coming from fish, chicken, pork, beef, and various kinds of seafood, and most importantly, a diverse range of herbs like lemongrass, mint, culantro, rau răm/Vietnamese mint and Thai basil leaves. Meats are lightly marinated, and enjoyed with fresh, uncooked greens and herbs. Vietnamese cuisine is definitely much less oily than Chinese, and has strong vegetarian element that is influenced by the Buddhist tradition. Still unknown to many, Vietnamese cuisine also has strong influence from French cooking as well. The photos below wouldn’t even begin to do justice in showcasing Vietnamese food, but it’s a good start to understand the freshness and variety of regional Viet culinary offerings. And how do they taste? Delicious, of course! What is the difference between Vietnamese iced coffee and the stuff I can get at McDonald's? Well, we do not call our coffee stuff. Furthermore, there are major differences between Vietnamese iced coffee and the McDonald’s variety, or any other variety for that matter. One thing is clear but not necessarily common knowledge in North America: Vietnamese coffee came from a strong influence we had under French colonial rule, but even with this fact, Vietnamese coffee is Viet people’s own creation. 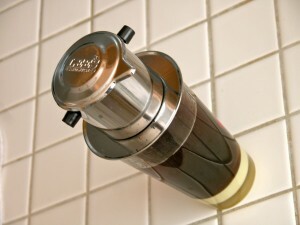 With a combination of dark French roast coffee ground, sweetened condensed milk, and the trusty and simple Vietnamese coffee filter called a “phin”, the final brew is a strong concentrated espresso-like coffee that can be poured over cubed or crushed ice or be further diluted to enjoy hot. Many Viet coffee lovers drink straight from the concentrate, and it should be noted that Vietnamese coffee is meant to be enjoyed slowly, not guzzled down in a few gulps. 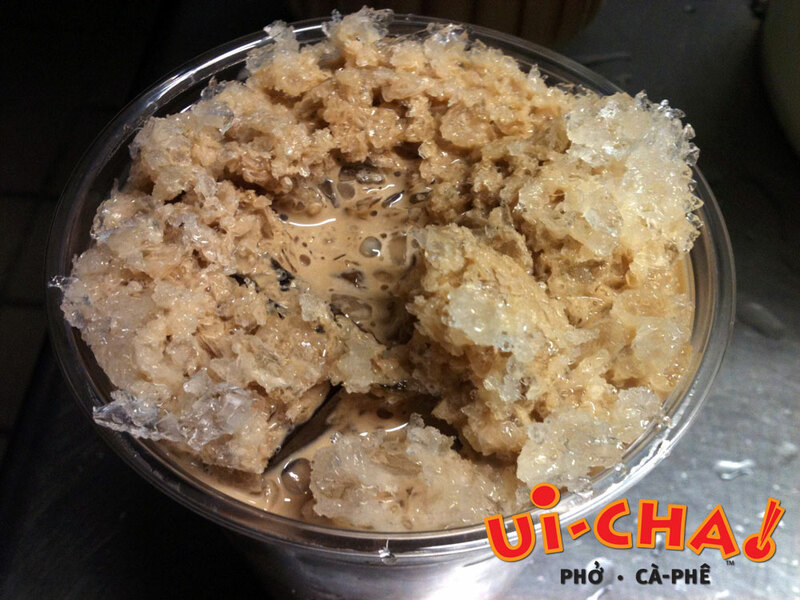 Ui-Cha!’s own brew of Vietnamese coffee stays true to the taste of the classic Vietnamese coffee utilizing modern techniques. Because we do not serve a front of the house as in a traditional restaurant, we have created a way to serve the university’s coffee enthusiasts with authentic Vietnamese iced and hot coffee without the use of the phin. For those who mistakenly think we overly dilute our coffee when they see Ui-Cha!’s serving of a cup packed full of ice, the reality is it couldn’t be further from the the truth. Because of the concentrated nature of the coffee, we serve our brew with a predetermined mix of cubed and shaved ice packed in the cup to serve several purposes. One, the shaved ice does its part to dilute and cool the beverage for immediate enjoyment so that the first few sips are strong but quite tolerable for the vast majority of people; two, the cubed ice maintain the cool temperature but melts much more slowly so that the beverage can still give a great taste even after 1-2 hours. A great source with step-by-step instruction on how to make your own Vietnamese coffee can be found at Hungry Huy’s Vietnamese Iced Coffee Recipe (Cafe Sua Da). What is it about Ui-Cha! that a customer will choose you over the other competitors? We at Ui-Cha! understand that customers have a choice when it comes to meal selection, especially for students on a tight budget. In fact Ui-Cha! Pho fully supports a wide and competitive selection of food choices in the UC Food Court. Toward this end, Ui-Cha! aims to provide fresh, healthy, tasty and fulfilling meal options that are very affordable. We constantly run special offers, promotions and customer loyalty programs that reward our customers with deep discounts and other perks. 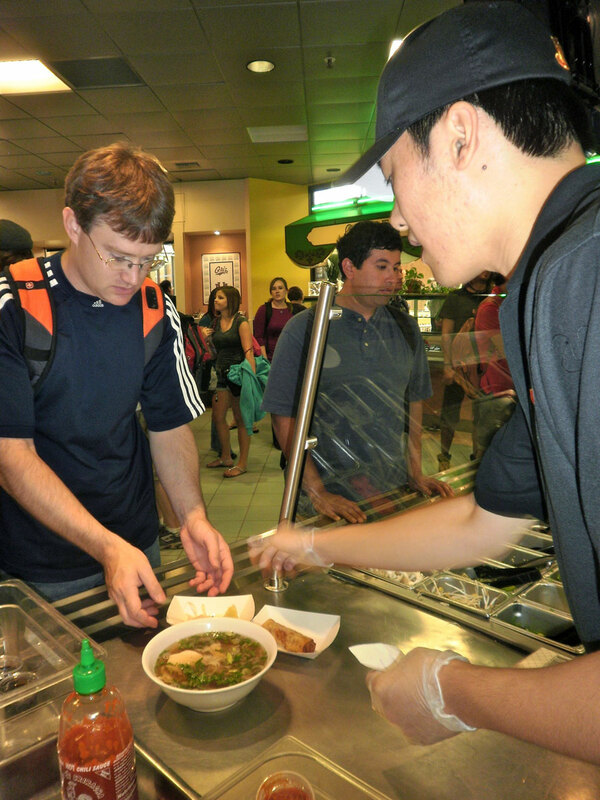 Most everything in our signature dishes including the three types of pho, the grilled meat rice plates, the banh mi sandwiches and the coffee, are prepared right on the premise in the back kitchen of the Food Court or downstairs in the Catering Department. We continuously source new vendors to search out ingredient freshness and affordability, and we constantly train our staff on preparation methods, quality control, customer service, and overall responsible citizens of the UM and of the City of Missoula. Ui-Cha! is a start up restaurant, and we believe that our products, prices and customer service provide a great value for our patrons. Does all of Vietnam eat the same types of food? Vietnam is a country with three distinct regions: North, Central and South. Add to this numerous ethnic groups in each region and you have a much more diverse culinary range in Vietnamese cuisine. Many Viet people themselves constantly find new dishes to enjoy as they travel from one region to another. About the only things that can be considered the same among all Vietnamese are consumption of rice and the use of fish sauce in daily cooking. Oh yes, and phở too, even though pho itself does vary as well. 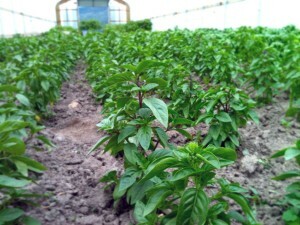 How do you plan on getting fresh veggies and herbs during the winter months? Vietnam is located in Southeast Asia, a country of tropical lowlands, hills, and densely forested highlands. It is very humid and hot, especially in the Southern part. As a result, fresh greens and herbs are abundant year-round and are utilized to the fullest in much of Vietnamese cuisine, and pho is no exception. For Ui-Cha! to bring and maintain freshness of ingredients to the University of Montana, we are overcoming a number of hurdles including using ingredients from local farm vendors during the spring and summer months, and bring in fresh ingredients from California during the winter months. The reality is, non-exotic ingredients such as carrots, cabbage and onions can be sourced either locally or from local vendors pretty much year-round. 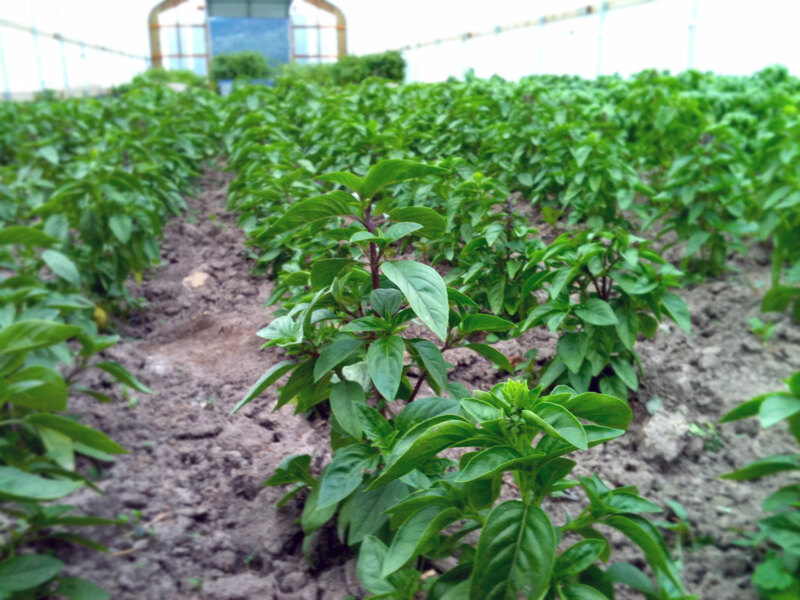 On the other hand, herbs such as Thai basil and shallots that are key elements in flavoring the Vietnamese pho experience, can’t be easily obtained in Montana anyway due to lack of local demand. In this case, we have identified local farmers who will grow them for us during the warmer months so that we can buy locally. OMG IS THAT MEAT RAW!? Yes that is raw, thinly sliced eye of round beef steak. 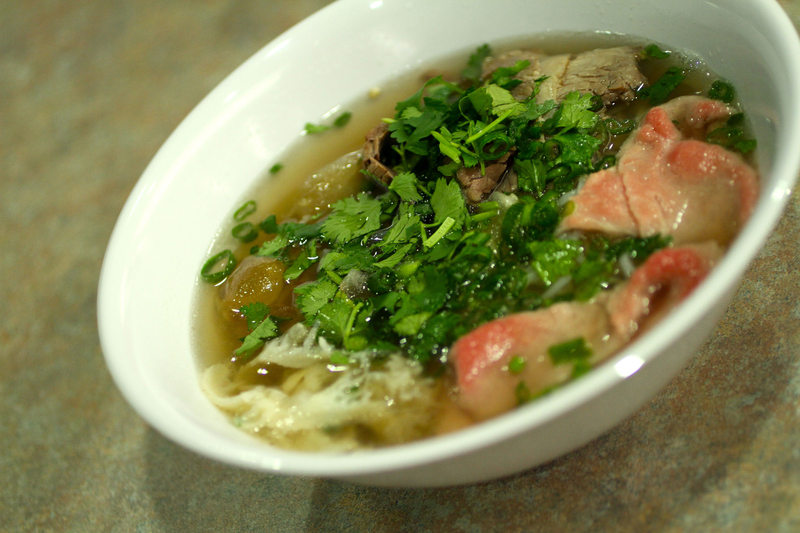 When served, the hot broth is poured over the sliced beef and will cook it right in your bowl. That is how it is normally served in restaurants. At home, some people actually cook the beef in a ladle dipped in the boiling broth pot to get well-done beef slices. You can request this for your bowl at the restaurant as well. The choice is yours on how you want to enjoy your beef. What exactly is in fish sauce? How is fish sauce made? 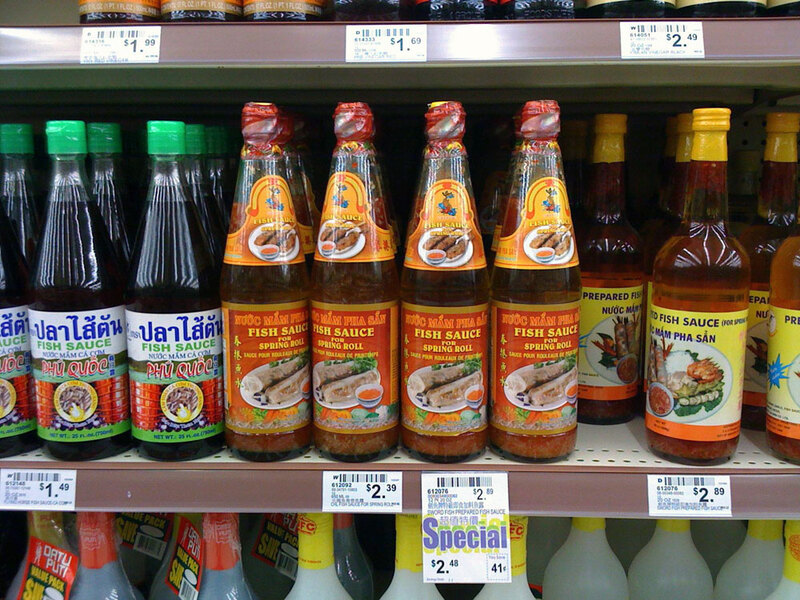 Fish sauce or nước mắm in Vietnamese, is a basic ingredient used in many Southeast Asian countries, most prominently in Vietnam and Thailand. Fish sauce is made from various kind of aquatic animals (shrimp, mackerel, or squid, for example) depending on geography. It is a cooking ingredient and a dipping sauce in its pure form, but it is also flavor enhancer and a base for mixing other tasty sauces as well. Nước means water, liquid, and mắm translates to fermented fish in most cases, but could be applied to fermented or pickled vegetables. 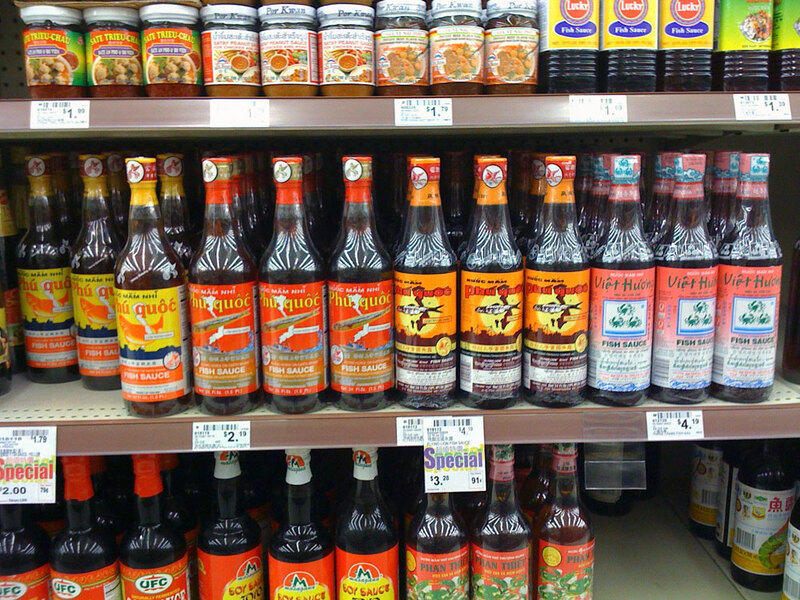 When used in Vietnamese cooking, fish sauce is used much like salt in western cooking, but its enhancing effect goes beyond that, resulting in much more flavorful dishes of all kinds, whether pork, chicken, beef, seafood, etc. The Ui-Cha! fish sauce for dipping is mixed on premise to serve you with a tangy and tasty flavor bomb for the rice plates and the cha gio pork rolls. In restaurants and in homes, the dipping fish sauce (called Nước mắm chấm) is almost always mixed from the pure fish sauce with other ingredients added by the chef. 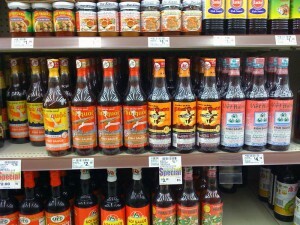 With modern technology and demand, dipping fish sauce has also been commercialized with pre-mixed varieties that one can now buy at many Asian supermarkets. For some great accounting of what fish sauce is, you can read more on “Why Phu Quoc Fish Sauce Tastes Good” by Andrea Nguyen. Also “Nước mắm – soul of Vietnamese dishes” is a good read. How do you make the broth for the vegan pho? The Ui-Cha! Vegan Pho is a very special pho. Normally you cannot find vegan pho in a typical Vietnamese restaurant or pho restaurant for that matter. Ui-Cha! Vegan Pho is purely vegan, meaning it is prepared as pure vegan with no animal products. It is developed by Ui-Cha! specifically for the UM. Beside using pure vegetable and vegan ingredients, care is always taken in our vegan pho preparation, from using separate knives, cutting boards and other kitchen tools, to extra effort in storage and serving steps to ensure there is no cross contamination with other meat products. 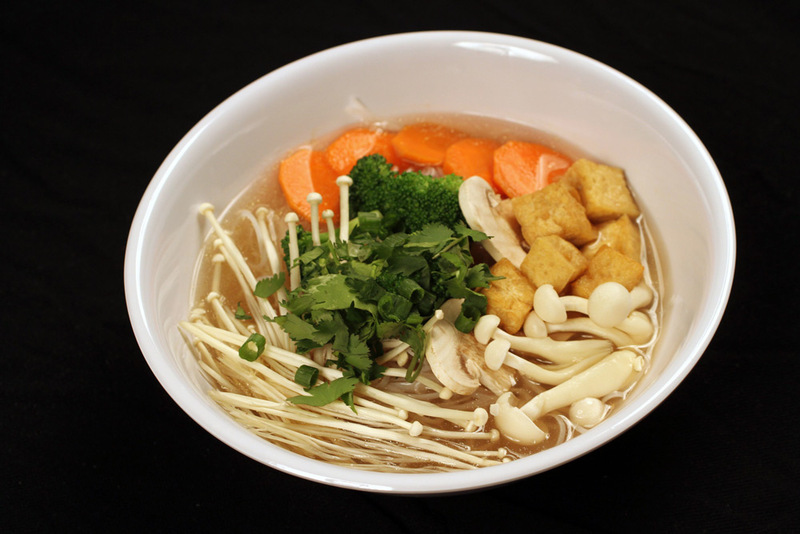 Tell us what you think about our vegan pho via a comment below. Ui-Cha! Serves Gluten-Free Menu Items!